We’re not starting at the very beginning, but in terms of having some knowledge of what the society was like, what they were wearing and how advanced the clothing was compared to what followed it and for quite some time after the disappearance of this society, it’s not really possible to go further back than the Minoan Civilisation. We’ve only been properly aware that they really did exist for just over a hundred years and maybe, hopefully, one day we’ll know more about them than we’ve so far learned, but what we do know is pretty incredible. So, first things first: when were they around? From roughly 5,000 B.C. to roughly 1,700 B.C. To give it a little perspective, The ancient Egyptians arrived on the scene in about 3,100 B.C. and the classical (ancient) Greek culture starts at roughly 500 B.C. There’s a culture there before that – well, the Minoan civilisation was on that there Crete! – and there’s a period known as the Dark Ages from c. 1,100 B.C. – c. 750 B.C., but when we’re looking at all the pretty things from Classical Greece, we’re mostly looking from about 500 B.C. and definitely from about 323 B.C. when Alexander the Great finished having wars (and died, as you do) and Greece went into the Hellenic period. Huge apologies for so much dating, please note the dates are approximate and now that we’ve figured out how very early on in our history those Minoan folk popped up, we’ll move on to the more interesting stuff: what they used to wear. You’ve already spotted the photo at the top. 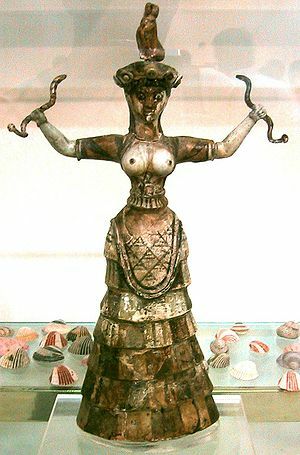 This is either a statue of a snake goddess, or a priestess of the snake goddess, this was found at Knossos. The major problem we have with a society so old and so long disappeared is knowing for sure what figures represent. However, there are other murals of women dressed like this, so we know that this must have been something that women wore. Whether it was everyday clothing, especially for ceremonies, worn only by a certain class of woman, we can’t know for sure. But this costume was not just a one off, it is seen in a lot of art from the culture. shocking image, her clothing is even more interesting. This is prior to a period when what we saw women and men wearing clothing that was held together by clasps, pins, belts, sashes girdles; in short, clothing that was not sewn. So look again at this Minoan figure and now notice that what she is wearing is a sewn garment. The skirt she is wearing may have had framework underneath it to support the bell shape of it. The blouse she is wearing is also sewn and then cut rather low. There was also an item of clothing that might be worn under the blouse, which was similar to the corsets that were worn from around the Renaissance period onwards. You’ll also notice from the first image and the one to the right that the clothing was colourful and the breasts and hips large with very small waists. When the Minoan civilisation was discovered in the 19th century their shape was so similar to contemporary fashion that the images of women, such as the snake goddess were called La Parisienne, because of the similarity of shape. We can’t be sure, but it is thought that the belts holding the waists in (this was worn by men as well) may well have been worn from childhood onwards, thus changing the natural shape of the body. Again, we can’t know this for sure. became more complex and ruffled, they were made from a variety of materials although probably mostly linen or wool. They had complex designs and patterns on them, which improved as the civilisation became ever more talented in art, design and ‘industry’. We can also see that hair was styled, possibly with semi-precious jewels if you were wealthy enough, and that jewellery – look to your left! – was pretty impressive as well. I think that one of the most interesting things about what we now know about the Minoan culture is that it came to us very late, so has had little direct effect on women’s clothing since then. We can see the impact of classical clothing on some later designs and especially in early 20th century clothing. But, at the time we discovered that these pretty marvellous people had existed, women were wearing shapes very similar to the shapes that women had worn on a Greek island millennia before. Some people think that the Minoan people, who died out very quickly and almost without a trace, may well have been the people of Atlanta, the mythical culture that sank into the sea. When we look at the intricacy of their art and design and clothing and then think about how early in our history all of this was happening, it’s not surprising that people think they may be the great lost culture who were hundreds or even thousands of years ahead of the societies that continued on when they disappeared. One last word about this long gone society. We are pretty sure that their were far more goddesses than gods in their religions and that their religions were matriarchal. They weren’t a society without war, but were relatively peaceful. There is also suggestion that they might have gone in for human sacrifice, but hey! Nobody’s perfect!